You who so plod amid serious things that you feel it shame to give yourself up even for a few short moments to mirth and joyousness in the land of Fancy; you who think that life hath nought to do with innocent laughter that can harm no one; these pages are not for you. Clap to the leaves and go no farther than this, for I tell you plainly that if you go farther you will be scandalized by seeing good, sober folks of real history so frisk and caper in gay colors and motley that you would not know them but for the names tagged to them. Here is a stout, lusty fellow with a quick temper, yet none so ill for all that, who goes by the name of Henry II. Here is a fair, gentle lady before whom all the others bow and call her Queen Eleanor. Here is a fat rogue of a fellow, dressed up in rich robes of a clerical kind, that all the good folk call my Lord Bishop of Hereford. Here is a certain fellow with a sour temper and a grim look—the worshipful, the Sheriff of Nottingham. 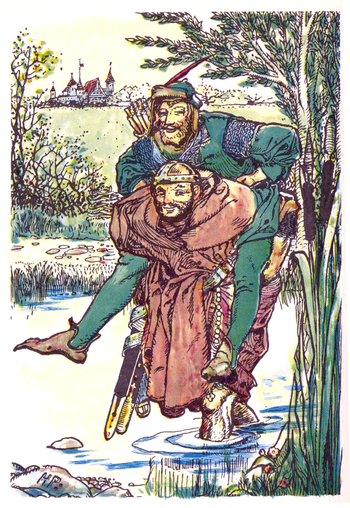 And here, above all, is a great, tall, merry fellow that roams the greenwood and joins in homely sports, and sits beside the Sheriff at merry feast, which same beareth the name of the proudest of the Plantagenets—Richard of the Lion's Heart. Beside these are a whole host of knights, priests, nobles, burghers, yeomen, pages, ladies, lasses, landlords, beggars, peddlers, and what not, all living the merriest of merry lives, and all bound by nothing but a few odd strands of certain old ballads (snipped and clipped and tied together again in a score of knots) which draw these jocund fellows here and there, singing as they go. Here you will find a hundred dull, sober, jogging places, all tricked out with flowers and what not, till no one would know them in their fanciful dress. And here is a country bearing a well-known name, wherein no chill mists press upon our spirits, and no rain falls but what rolls off our backs like April showers off the backs of sleek drakes; where flowers bloom forever and birds are always singing; where every fellow hath a merry catch as he travels the roads, and ale and beer and wine (such as muddle no wits) flow like water in a brook. This country is not Fairyland. What is it? 'Tis the land of Fancy, and is of that pleasant kind that, when you tire of it—whisk!—you clap the leaves of this book together and 'tis gone, and you are ready for everyday life, with no harm done. And now I lift the curtain that hangs between here and No-man's-land. Will you come with me, sweet Reader? I thank you. Give me your hand.